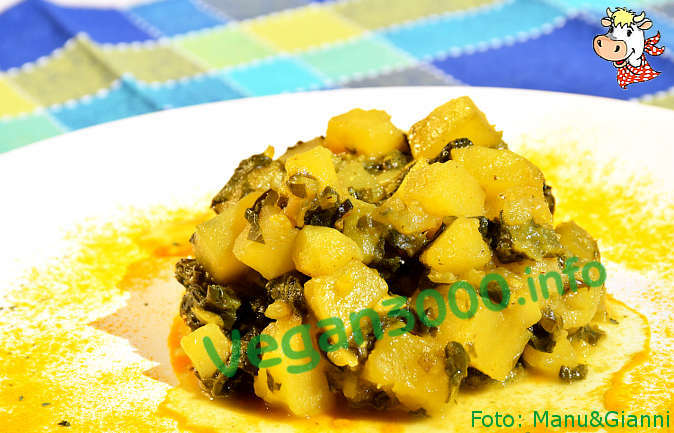 The Aloo Palak is a traditional Indian recipe, that is a spicy and very fragrant potato and spinach curry. Wash the spinach and salt into thin strips. Peel the onion and garlic and chop along with ginger. Pour a little oil in a pan and sauté the chopped onion, garlic and ginger for a few minutes. Add the curry powder, turmeric, cumin, coriander and stir. Leave on the heat for a couple of minutes, stirring carefully so that you can blend all the flavors. Add the potatoes and spinach, add salt, add a glass of water, stir and cook with the lid on for about 20 minutes, stirring occasionally and making sure that it does not stick to the bottom. Add more water gradually is absorbed during cooking. The dish is ready when the potatoes have become soft and spinach are almost completely undone. Davvero un piatto molto buono.